It’s almost dusk when we arrive at the Traditional House Museum set in the grounds of Chiang Mai University Art Centre. We've come to attend The Living Seeds Festival, hosted by Pun Pun, a sustainable living centre located outside the city. It has brought together organic farmers, mud house builders, musicians and educators to celebrate and teach about sustainable living. 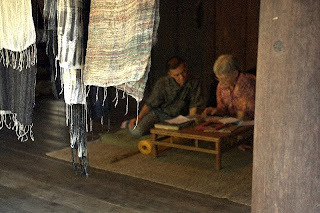 Under one of the traditional teak houses raised on posts, we find Thitichai, a 45-year-old Thai textile designer, surrounded by some of his naturally dyed textiles. 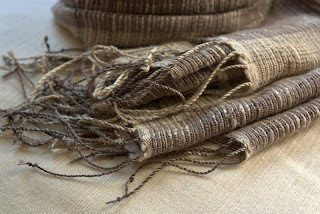 We browse through the scarves hanging on a twine line and find an unusual, highly textured piece. We know it's not traditional mulberry silk, yet it is different from other natural fibres we've seen here. It turns out to be handspun Eri silk, which was introduced into Thailand a few years ago. [See our blog entry of Feb.3, 2008 on Eri silk.] Thitichai tells us that Eri slk is now created in 16 villages around Thailand, thanks to trainings done by Fai Gaem Mai, Knowledge and Technology Center for Northern Textile at Chiang Mai University. We're fascinated to see the Eri silkworms spinning their white cocoons in a makeshift cocoon house on top of a table. It's made from a cardboard box which has been refashioned with cardboard dividers to create 2 by 2 inch "rooms" in which lie small, plump white silkworms and the beginnings of their cocoons. Next to their home sits a small bamboo basket of fresh green leaves. These small worms are very different from the huge Eri silkworms we saw in Ban Panasawan. We wonder if the difference in size is due to the different leaves they are fed here. We ask Thitichai if he eats the pupa and he assures us that no worms are killed in the production of this particular Eri silk (unlike the village we visited, where the pupae are eaten as an important source of protein). Like some Tussah silks from India, this Eri silk can be called "peace silk" or "vegetarian silk." I'm drawn back again and again to this scarf, with its bands of dove gray created from ebony fruit alternating with the softer very pale, creamy gray of the undyed silk. The texture is marvelous. The warp (lengthwise) yarns are long, thin slivers. They have been painstakingly spun on the special spinning wheel introduced into Thailand by Fai Gaem Mai. The weft (crosswise) yarns show off the slubs -- thick, then thin sections -- that are a trademark of good Eri silk spinning. Together, they give the illusion of great depth and intricate weaving, created by the use of alternating rows of 2 colours of weft yarns. The scarf is costly, due to the work of spinning these special yarns. I love the look and feel, so I buy it for myself. We talk with Thitichai about the possibility of returning on Monday to discuss an order for more. He seems reluctant at first, but then agrees to weave a small order of 10 scarves for us that will be ready in 2 months. Can we wait? Yes, of course. It takes the time it takes. "Slow fashion" indeed! On Monday afternoon we return to the house where we now find Thitichai sitting upstairs on the porch that wraps around 2 sides of the building. We learn more about him over the course of a couple of hours and decide that, although we usually buy from rural women's weaving groups to give them much-needed income, this is a valuable project to support, as it's helping establish new traditions and artistry for the village weavers, built on the foundation of their age-old skills. Fascinated by textiles at an early age, Thitichai studied with Mrs. Saeng-da Bunsiddhi, the founder of the Pa Da Cotton Textile Museum. [See our #6 blog entry about her.] He has a workshop just down the road from Pa Da -- a weaving centre with 30 floor looms, now employing 10 weavers, whom he gives creative reign to experiment with their own designs. He has won many international awards for his textile designs in Japan and Europe, including placing in the top 10 at a UNESCO textile competition. He has also helped many Thai weaving projects. After winning an award from the King of Thailand for this work, he left his textile work behind to enter the monastery, becoming a monk and meditation teacher for 8 years. 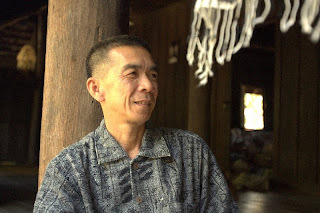 Now, returning to his passion for textiles, he runs the Living Textile Museum as part of the Traditional House Museum, where he teaches Eri sericulture (the creation of silk yarns), spinning and natural dyeing. He travels too to other parts of Thailand, teaching Eri silk skills as a volunteer. Thitichai's eyes dance and his laughter rings out as he tells his story and lovingly shows us the textiles that drape over every surface of the room next to the porch where we first talk. Thitichai's work now is to promote "living textiles," helping spread new sericulture, spinning, dyeing and weaving techniques -- creating new ways for village weavers to earn income. He loves working with Fai Gaem Mai, he tells us, and we're happy to support his work, even on a small scale with our small order, which he insists on spinning and weaving himself to ensure the highest quality. We suspect we'll see, in future, more of this kind of Eri silk here, as the weavers' skills grow and the weaving itself evolves with visions of creative new designs.